Cleerline Technology Group and Access Networks have teamed up to launch Cleerline NSF. Cleerline NSF delivers ease-of-termination and eliminates the time-consuming process of stripping the glass fiber. “There couldn’t be a better partner,” said Krista Bergman, director of sales for Cleerline Technology. “The best fiber solution meets the best networking solution.” Access Networks is the premier provider of pre-programmed enterprise-grade networking solutions for the modern home. Cleerline NSF utilizes a patent pending coating as an integral part of the glass that does not require removal, unlike typical buffer coatings that must be stripped/removed from standard fiber. NSF fiber also produces incredible advancements in flexibility and increased tensile strength. For over a decade, Access Networks’ certified team of IT and AV professionals have worked directly with custom integrators to provide customized networking solutions that are equipped to handle the unique and growing demands of the automated residence. Cleerline NSF is compatible with all fiber optic connectors on the market. 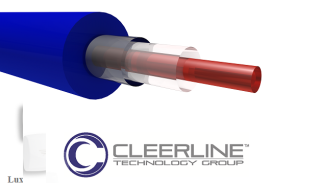 According to Cleerline Technology Group, it is a “cut, cleave, and connect” system delivering the easiest to terminate fiber optic cable available.